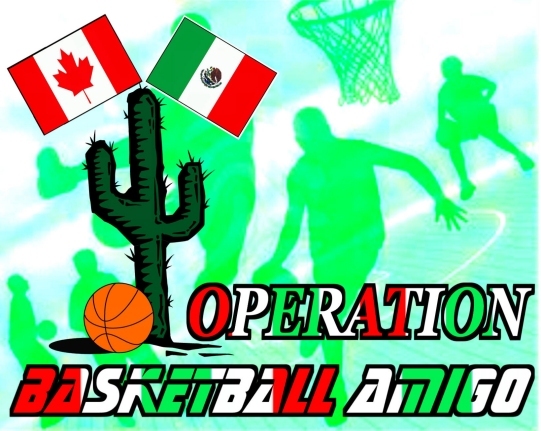 Missions Update: Colegio Mexico Lebre (Free Mexico College) has invited Stony Plain Basketball to send another team of coaches to Colonial Villa Esperanza, Juarez, Chihuaha, Mexico to host the fourth annual Operation Basketball Amigo tournament and skills camp. The date is Nov. 8-14, 2014. This was my fourth year going down to Mexico, and each year is special. There is one thing that makes me want to keep coming back, and that is the love of all the Mexicans. You meet so many new friends and the love that they have for all the Canadians that come down can be overwhelming. I cannot put into words the love that pours out of the hearts of the Mexicans. There is no comparison. This Year I went for 2 weeks instead of just 1, first week for work (digging) and second week for basketball. Out of the two weeks there was so much that I can’t pick a favorite moment. Each year you learn something new and make more friends than the previous year and I am truly blessed to be able to go back year after year. I can’t wait to go back in 2014. I highly recommend going down to Mexico on this life changing experience! Once again the trip was amazing! This was my fourth time going down, first time for 2 weeks rather than 1, and the extra week provided so much more amazing moments! Each year is a different experience, meeting more people, participating in different building projects and slowly catching on to the language. The people there are incredible, full of love and living for God, I miss them already and look forward to seeing them again next year. This year I had the most fun playing with the kids from the primary school and kindergarten :). Every day we would play at recess and after school (which was at noon) and would have so much fun, even though we didn't speak the same language, we still were able to spend time together and enjoy each other. The language of play. We connected with the kids and played as much as we could for the 2 weeks! I also enjoyed the work, it was hard for sure (mostly digging) but worthwhile. We helped finish the house for the principal and pastor and then poured the concrete for the new orphanage. The thing I will bring home after this trip is to make the most of the time I have. I made it my goal for the 2 weeks to use every minute I had to do something, whether work or play with kids or talk to others. It was exhausting, but I knew I only had so much time there and wanted to make the most of it. Rest when I get home, that's what I told myself. And it was so rewarding :) When I got home I thought, why should that be my goal only when I'm in Mexico? That should be my goal in life, make the most of the time I have! Overall it was another incredible trip, and I would go back in a heartbeat! We go there to serve and bless them with our gifts and talents, but I think they bless us more than we could ever do for them! It is a life changing trip, and we are blessed to have the opportunity to participate. "In Nov. 2011, I traveled to Mexico with a group of people from Operation Amigo. 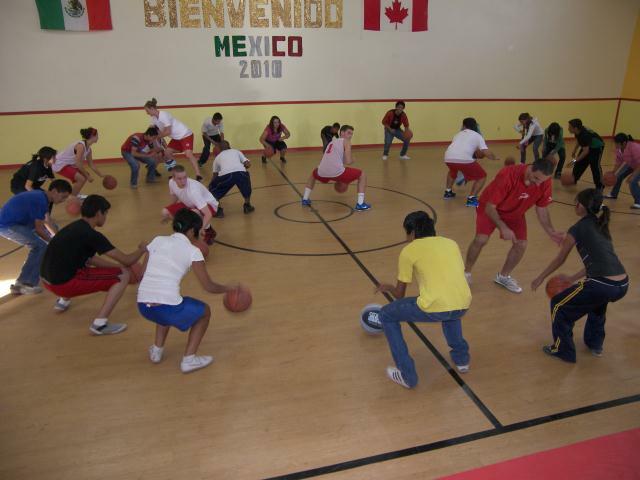 I first hear about this mission trip from Roc Weigl when I attended the Stony Plain Summer basketball camp last July. My first thought was that it could be fun. My thought was completely wrong. This mission trip had to have been the best experience of my life! It is very hard to put this experience into words and give it justice. Going to a boarder town in Mexico, a town that is very impoverished and trying to teach children how to play basketball seemed unrealistic. Some people might think it is crazy, but from my experience, it is the best thing you can possibly do if you are wishing and willing to help people. Al, who started Operation Amigo, has a very open heart towards the Mexican people. He has built schools, houses, churches, and gyms for them and is willing to keep giving, to try and help as much as he can. When the group of basketball people arrived most of us did not know what to expect. Even those of us that had expectations, they were quickly displaced. You hear how Juarez is a very violent place and it can be, but Al took care of us and never put any of us in harms way. This experience was life changing for me and, I am sure, for some of the children. After meeting so many kids and adults, playing basket all just seemed to be an instant friendship, even though there was a language barrier. Everyone seemed to become fast friends. When we were there we would be playing basketball with the children for about four hours a day on out courts and inside the gym. In the evening we would play games against the Mexicans for about an hour or two. The first day we played the Jr. High school boys and girls. The next day was the high school, then the teachers and the parents. On the final day we played “team Mexico” and participated in a giant fiesta. This was a celebration for us as a “Thank You’ for coming to help them. If you love being around children you would enjoy this experience. This year, there were over 150 kids, from ages 6-18 that came out and played basketball with us. We even had the privilege of coaching a child that was in a wheelchair. Almost every night after basketball we had something planned, from going out for dinner with the high school students, or grocery shopping with the teachers. No matter who you met there, they will always be your friend and help change your life. I know personally I have changed from this incredible experience. For anyone who is interested on going on this trip with Operation Amigo, I very highly recommend it! It is a life changing experience for you and the people you help down there. 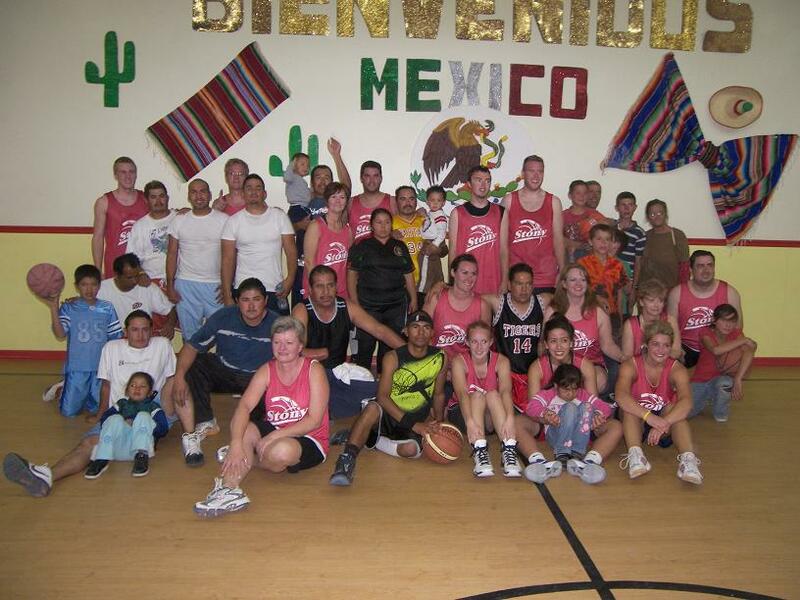 My memories of Mexico and playing basketball and helping the people down there will be with me for the rest of my life and I am hoping I will be able to go back sometime soon. I thank Al and Roc for asking me and allowing me to be a part of this incredible trip." "The one main thing that I learned on the Mexico basketball missions’ trip is that I really didn’t understand how lucky I actually was to have everything I did until I went to Juarez Mexico. I had always wanted to go to Juarez, because of what my grandparents were doing there through Operation Amigo. Near the end of my grade 12 year of school, I got a phone call from Roc asking if I would be interested to go on this trip through his church and right away I knew that everything was now falling into place for what became one of the most exciting and life changing trips I had ever been on. Now as we drove to our destination, the further we went out of the city the more I couldn’t believe what I was looking at. I could never imagine living in what they call home. When we first got there I had thought that it was all abandoned housing but then the truth came out when I was told that this was where they all lived. The houses were all falling apart, some without front doors and only a sheet in its place, and really looked like something that we would go and play paintball in back home. Every day the kids would come and the parents would come and I never saw them without a smile. I got to play with the kids and try my best to communicate with them and even though most of the time I would slaughter the Spanish and try my best at sign language, the happiness that they had was unbelievable. I would then ask myself, how could someone with really so little compared to what I have grown up with, be so happy. All I thought going down to Juarez was that I’m going to teach kids basketball and didn’t really think on how much of an impact I would actually make in the lives of the kids and how much they impacted my life while I was there. Now as our time there came to an end, I thought that everything would just go back to the way it used to be and that next time we went there they wouldn’t remember us. Both my grandpa and Roc made it very clear to me how much you will be remembered there and that they do not forget who you are. Seeing all the girls hanging off of Brayden also made it very clear that you won’t be forgotten. My grandpa said to us during breakfast that they don’t just see us for who we are but as an image of Jesus Christ and the love and hope that we bring to them is why they can come every day with smiles on their faces. As we left you could see the sadness on the kids’ faces and this is what gave me my change of heart and that I needed to come back because you will never know how much of an impact you can have on someone until you get that little card saying how much they love you and that they will miss you. I highly recommend that if a mission’s trip is something that you want to do then don’t hold back and go for it because you will never know what kind of a difference you can make in someone’s life until you go out and do it. I left Juarez with nothing but great memories and feelings and can’t wait to go back and see all my new friends and family that I made along the way." "Poverty. Happiness. Poverty. Happiness. Poverty. Happiness. The more I say these two words, the more I find it so hard to believe the two coincide with one and other. Before my trip to Juarez in November of 2011 I would never have thought that two features of life such as poverty and happiness would ever thrive in the same community. Driving from the airport to the compound I was in utter shock looking around to see the difference between this place and my home back in Canada. Houses without doors…did people actually live in those places that look like “forts” we made when we were children? To my surprise, yes. Garbage everywhere, torn apart buildings, baggers in the streets.. I’d be lying if I said I wasn’t a little frightened. After a short drive we arrived at the compound and I saw the amazing work that had been done to create a school and a chapel. I had taken buildings such as these for granted back home, I guess I assumed that most places just had them. After seeing the conditions Mexicans lived in, I was stunned to see how warm-hearted and welcoming they were to us Canadians. At chapel on Sunday and coaching basketball to the kids throughout the week was such an amazing experience.. words cannot even describe how the children made me feel. They were so grateful for everything they had although it was so little. Watching the kids learn a game that was not played as often in their community was heart-warming. Although I went down there to coach basketball I feel as though that was only a small part of what made my experience memorable. Getting to know the young children and the older high school students was a challenge considering the language barrier, but the warmth of each other’s company was merely conveyed through a smile. 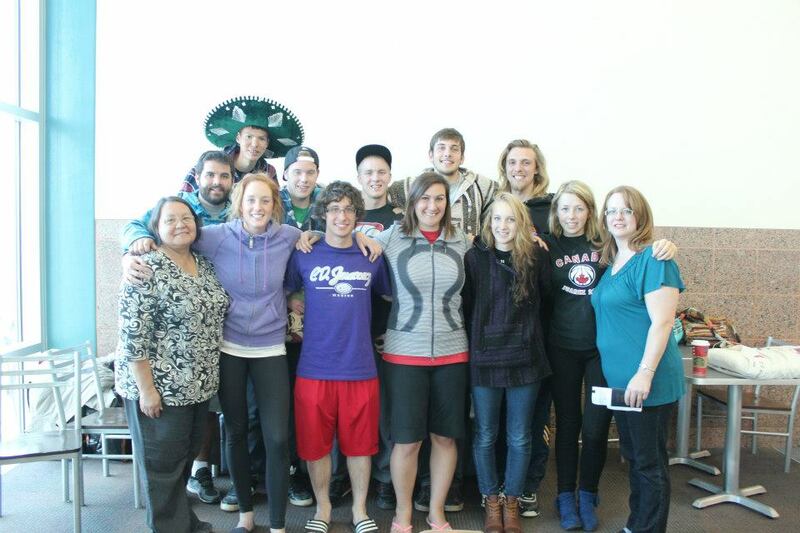 The Mexicans that I met were some of the nicest people I have ever had the privilege of knowing. The people who have the least amount, simply give the most. When we were on our way to Mexico, Roc had told me I would change these kids’ lives, but the truth is, these kids changed mine. They showed me what it is like to have the spirit of God with you all the time, and how we should share that love with one another unconditionally. This was one the most incredible experiences of my life, and would be honored if I got the privilege of going again." "Make Me a Servant, Humble and meek, Lord let me lift up those who are weak. a more effective servant to him when I returned home. It was dark when we landed in El Paso and began our journey from the airport across the border into Mexico. It became very clear to me as we journeyed out of the city centre, to its perimeter, what in fact the Lord was preparing me for. The darkness only partially prepared me for what the daylight would confirm. The beautiful compound which included Al and Miriam’s house, the secondary school, high school, and the Chapel lie in extreme contrast to the streets and houses outside the gates. I could not believe that anyone could live in the shacks they called their homes. Nor could I believe that they could be happy. I felt such sadness and helplessness for The people of Esperanza. Our first devotion that morning, Al’s message was clear. What so ever you do, do with your whole heart. Colossians….. Do it faithfully, diligently and happily. So begins our mission trip. We get a tour of the compound, and I am so impressed with what God can accomplish using a man and his wife and a deep rooted vision. Al and Miriam are truly faithful servants. There are three schools which hold 400 students roughly. There are close to 25 teachers, all warm faithful servants called to teach and better the lives of the children. To instill hope and security. As the days went along and our team was in full swing with the duties that were laid out for us, I could not help but to reflect on passages, and songs that to me were the essence of what we were doing. Roc would be humming or singing first thing in the morning and those songs or hymns would have deeper meaning as that day, and future days would unfold. They all took on new meaning to me. As we engaged in activities with the students, teachers and workers, I realized that, one particular hymn was ringing louder than most. “Lord let me life up those who are weak, actually, I was the weak that the Lord was lifting, rather than me lifting the Mexican Christians who are so strong in their faith. They lived simply, loved deeply and walked humbly with our God. It showed in all they did daily. Sandra and I were painting the back outside wall of the Chapel. She painted high on the Scaffolding and I painted low. At one point, she looks over the 15-20 foot brick boundary wall of the compound and tries to explain to me what she sees. I can’t believe what she is telling me, so I hand her my camera and she takes a picture. There on my camera screen was a picture of a house, with no roof, and four rooms, all the divider walls visible. The curtain on the only window visible in the picture was ripped to shreds. Sandra, says, “Do you hear that?” Sure enough, there was music coming from that very house. Another phrase rings loud in my soul. “Little is much, when God is in it.” My thinking is once again challenged. There is a feeling that I felt, and I am sure others experienced as well, a feeling that the pictures don’t convey. It starts, at the beginning of our mission trip as a feeling of sadness and despair for the people and their life condition. As the days progressed I felt the transformation of those feelings to ones of love, connection, hope, joy, and extreme faith. We had a wonderful conversation in the kitchen one day, about how the Lord was tilting us all, shifting our spiritual thinking. We would feel uncomfortable in this tilting process and want to come back to centre, and he would tilt us some more to stretch us out of our comfort zone. One very profound moment for me was an encounter with a young family. We had asked Al and Miriam before we left here, if there were particular families we could bring things for, and that we could possibly sponsor into the future. Two such families were brought to us, and we the ladies were able to take one mother Nataly, age 21, and her three children out for dinner, and take her shopping for necessities. She was raising her family by herself, her husband was in prison. I was so touched to see that all the items she chose as we went shopping were for her children, not herself. She was not selfish, she only wanted basic warm clothes for her children, and basic groceries. Our culture would say, Who does that? Nataly is not a believer, and I know that the spirit of God was there that day, and is at work in that woman’s life now. Through being obedient to Gods calling to be a missionary, we went to serve and did. We went to be changed and we were. This team worked very hard with its wide diversity of gifts, and this church can be especially proud of the young basketball coaches that touched the lives of so many again. Some reconnecting from the year before. Who would think that a basketball could be used as a way to connect God’s people and a way to bridge the gap? I was there, I saw the power of the spirit at work..
Strong bonds were formed with teachers, and lasting relationships with students and workers were formed. Church, we can be proud of our pastor and his wife…… they served God’s people very well on this mission trip. It was an amazing God experience. As the hymn says, Make me a servant, today. "This is my second year in a row going on the Operation Basketball Amigo trip, and once again it was an amazing experience. In comparison to last year’s trip, I can’t say that it was better or worse, but that each trip was equally amazing in it’s own way. I was prepared for what we were going in to, and was not afraid at all, but felt at peace and was super excited to spend time with the Mexican people again! There were many amigos from last year who I got to talk to again and many new faces who we began to build relationships with. Once again they all welcomed us with open arms and extremely generous hearts, treating us as their special celebrity guests for the week! It was important for us not to let that get to our heads though, because we were there to be servants, to spend time with the kids sharing God’s love through our gifts. Let’s be honest though, it wasn’t hard to show love since they were so open and full of God’s love already. The whole week was full of hugs, kisses, high fives, fist pounds, food and gifts, all of which were shared with friends. I think the lesson that most of us learned from this experience is that you don’t need material things to be happy. And by material things I’m talking about the basics like housing, drinkable tap water, clothing and the like. These things are not easy to come by for a lot of the people there. One of the families lives in a house with no doors, just imagine living there in -20 weather, which is what the temperature got down to last winter. I don’t think it’s possible to imagine that, and yet they are the most beautiful people you would ever meet. Full of love and happiness and generosity. How can you explain that? Well, they know Jesus. They know He will not forsake them and that He loves them. So they share this love with everyone they meet, and it is overwhelming to experience the mission that they are on. Even though we were the ones officially on a missions trip, the Mexican people are living God’s mission and sharing it with us, reminding us what it’s about, and even giving us a new perspective on happiness. The team we had did an amazing job, serving, building, coaching, cooking, loving and playing, but I think we all came back changed people because of God’s love. It was a great trip at the perfect time in my life to challenge me to be a light for God even when going through unfortunate situations. A piece of my heart will always be with them and I can’t wait until our next trip! I was extremely blessed!" "In the beginning, from knowing what I had about Juarez, I was afraid of what it would be like when we went. Afraid because of the danger that I had been told was there, afraid of what was unknown to me. I was also nervous about how effective I was going to be personally, I didn’t know the language so I wouldn’t be able to communicate with the kids. All of these doubts and fears evaporated the very first day that we were there and went to their church. None of the fears that came from this world mattered anymore. I was not afraid or nervous because of the peace and love that God provided to the people, and in turn, to me. We were able to communicate, not because I was slowly learning some Spanish words and phrases, but because we knew God’s love. They showed an overwhelming love for us, even though we came into their home not knowing their language. A love that does not come from all the things they have, or the money, or anything material like that, but it comes from their faith in God. Thus, the week was filled with joy, smiling faces, laughter and tears. It was a fantastic experience, and I can definitely take a lesson from them as to how to love everyone everyday. I will return…"
"Juarez Mexico was a life changing experience. It was a true testament of putting all you have in God. These people were so poverty stricken, in our eyes, and yet they were happy. They smiled all the time. They put everything they had in their Lord and Saviour Jesus Christ. It was so eye opening; to see this, I feel like that I learned a lesson in that aspect because I feel like I took for granted the situation I am living. I learned that I need to worry less about money and materialistic things and be happy with what I have and put what I do have, in the hands of God because he is watching over me, no matter what. I was struggling in my walk with God before this trip, trying to figure out what the heck God was trying to do in my life, and I found that this experience was such a good trip to be lifted back up. I feel like my faith is very strong, though it has its times of failure, it felt GREAT to be doing the Lords work, and just building the relationship with the people of Juarez, they’re amazing people, and I love them. God bless Roc and Laura for giving me this opportunity to experience this trip, it was unbelievable and I feel like my words cannot express the amount of Gratitude I have towards Roc and Laura as well as Al and Miriam for allowing me to experience what I did in Juarez. God Bless! I love Juarez Mexico and its so rewarding doing God’s Work." Young @ Heart of Stony Plain, 780-963-5782.